Only a veterinarian can diagnose diabetes insipidus. Diabetes insipidus is not to be confused with diabetes mellitus, the so-called "sugar diabetes" common among humans and non-human animals. Unlike diabetes mellitus, diabetes insipidus is rare in dogs. It is not a condition of the pancreas, but rather a condition due to a lack of certain hormones. Diabetes insipidus is often called "watery" or "weak" diabetes and there are two types: neurogenic and nephrogenic diabetes insipidus. Neurogenic diabetes is also called central diabetes insipidus and is due to an underproduction of the hormone vasopressin, the hormone responsible for regulating the body's use of water. Vasopressin is released by the hypothalamus, situated in the brain. Neurogenic diabetes is a deficiency of the hormone ADH, the diuretic hormone. The function of ADH is to reduce the flow of urine. This helps the body keep the water necessary for bodily functions. It is a problem found in the kidneys. Diabetes insipidus has two causes depending on the type. If the dog is diagnosed with neurogenic diabetes insipidus, it could mean there has been a trauma to the brain since the hypothalamus is in the brain. It could also indicate the presence of a brain tumor. There could a problem with the pituitary gland, which is responsible for the hormone's release into the bloodstream. Many cases of neurogenic diabetes insipidus are idiopathic, meaning they are of an unknown cause. Nephrogenic diabetes insipidus is caused by a problem in the kidneys, such as cysts or a protein imbalance, or a problem with electrolyte imbalance. It could also be congenital, caused by cancer, or secondary to infection or an adverse effect of medication. If you notice your dog's thirst or urination has increased, he's dehydrated or eliminating in the house, contact your veterinarian. Frequently, the dog's coat becomes lackluster and thin. The veterinarian will perform a complete physical exam and order a battery of tests including blood and urine tests, hormone and electrolyte level assessments, and possibly an MRI or CT scan. 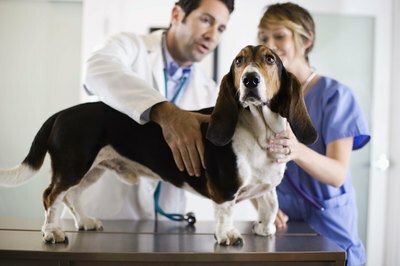 The vet will also take into consideration the owner's observation and report of the onset of symptoms and the dog's changes in daily routine or any possible injury or trauma. Diabetes inspidus is very rare in canines. It cannot be cured, however, much like diabetes mellitus, it can be controlled through medication. The dog is given an intranasal or injectable solution containing an antidiuretic hormone which will keep the symptoms under control and the disease in check.